Still Daddy | Husband. Father. Bourbon enthusiast. If you haven’t, first read my Intro to help you understand my review system. When late spring weather turns to the warmer side, I start to crave refreshing drinks. Scotch gets put away at the slightest hint of winter’s passing. Bourbon can be satisfying on ice in the heat, but I tend to enjoy it most during the transitional seasons (spring and autumn). A Mint Julep is a treasure of a cocktail any time in the warm season (even though it’s traditionally used in spring, around the time of the Kentucky Derby), but nothing is so satisfying in the heat, to me, as a chilled beverage accompanied by soda of some kind, and something citrusy. Enter the gin and tonic. Now add my search for really good gin. I like to buy local when I can help it, even in my travels. Maybe it’s because I live in New England and we have ample supply of ‘local’ goods, or maybe I just like supporting my neighbor, or the little guy. We rely on each other, after all. Regardless of reason, local is my preference when it’s available and priced well (sometimes local is unaffordable). I get into that in slightly more detail here. Berkshire Mountain Distillers (BMD) is located in Sheffield, Mass, barely outside of Connecticut, my home state. For distilleries, it doesn’t get much more local than that. In Connecticut there is only one legitimate distillery that I’m aware of*, so having a distillery as close as BMD is fantastic. BMD distills and bottles several products in house including a bourbon (not ‘straight’, so one can only assume it’s quite young), and a corn whiskey. But the subject of this review is not their whiskey. It’s their gin. Ethereal, to be exact, which is a limited yearly release separate from the standard offering, Greylock. I’m reviewing Ethereal, batch 10 (white label; the label changes color with each batch). I couldn’t tell you what year this is from as even BMD’s own website has tasting notes only from batches five through eight (at the time of this writing) and the years aren’t listed anywhere. Junpier, of course; a little pine-y. Little astringency, though it’s detectable. Pleasantly sweet, slightly citrus, slightly fruity. Barely floral. Again, please note that I’m tasting this in a gin and tonic, not straight or in a martini. This is sweet. Not overly sweet, but I’d easily categorize this as an Old Tom style gin (not knowing a whole lot about the ins and outs of gin, Old Tom is a sweeter, less dry style). What I’m finding particularly enjoyable about this G&T is that the juniper and light citrus is accompanied by a fruit. At first I would’ve called it blueberry (which goes smashingly with lemon), but the more I drank it the more I became unsure. At this point I’d say it’s definitely a berry. Blueberry, raspberry maybe. Maybe a mixed berry essence. Regardless of the exact source, it’s a hit for me. I tend to enjoy the sweeter style gins, and the combination of juniper, light citrus and berry has me coming back to this for more. After the tiring, slightly warm day I had today, I knew this was exactly what I wanted. Sweet, pleasant, refreshing. Were this a standard offering, and not a special release, I would readily recommend it as a stock item. I’d easily keep this on hand. But, given its limited release status and the variations from batch to batch (stated by BMD), I can only recommend this as a bottle purchase. Certainly, to me, worth the price (at the low $30’s mark) of a whole bottle to enjoy. What would move this into a regular purchase would be either my own positive experiences with multiple batches, or recipes (or, at the very least, tasting notes) accompanying each batch. As it is, I have no idea what’s in this batch. All I know is what I’m experiencing which, for me, takes away from it. I want to know. What’s this fruit essence? Is it fruit or is it something else? Is the next batch going to be more on the dry side or are they all sweeter given that Greylock, the regularly available expression, is a London Dry style? Too many questions to make this a regular purchase. More of a curiosity worth a try. Though, in fairness, I’ll likely buy another batch to see how it goes. But as I’ve only experienced one thus far, a bottle recommendation is all I can give it. If you have had, or have, another batch, let me know how it is. *The only distillery I’m aware of is Westford Hill Distillers in Ashford, Conn, which makes mostly eaux de vie and an aged apple brandy which I have but haven’t yet opened. There are other ‘distilleries’ in CT like Onyx, which purports to be local, but is in fact sourced corn distillate that’s only bottled in state. While that may mean locally bottled, and consequently local jobs (which is great) it’s not a local product. That’s fine, of course, in this capitalist country, but claiming to be ‘Connecticut’s first legal moonshine’ (an oxymoron as ‘moonshine’ is illegal; making it legal removes the moonshining aspect of it, rendering the title meaningless) is a lie. It’s Connecticut’s first legal bottled distillate at best. 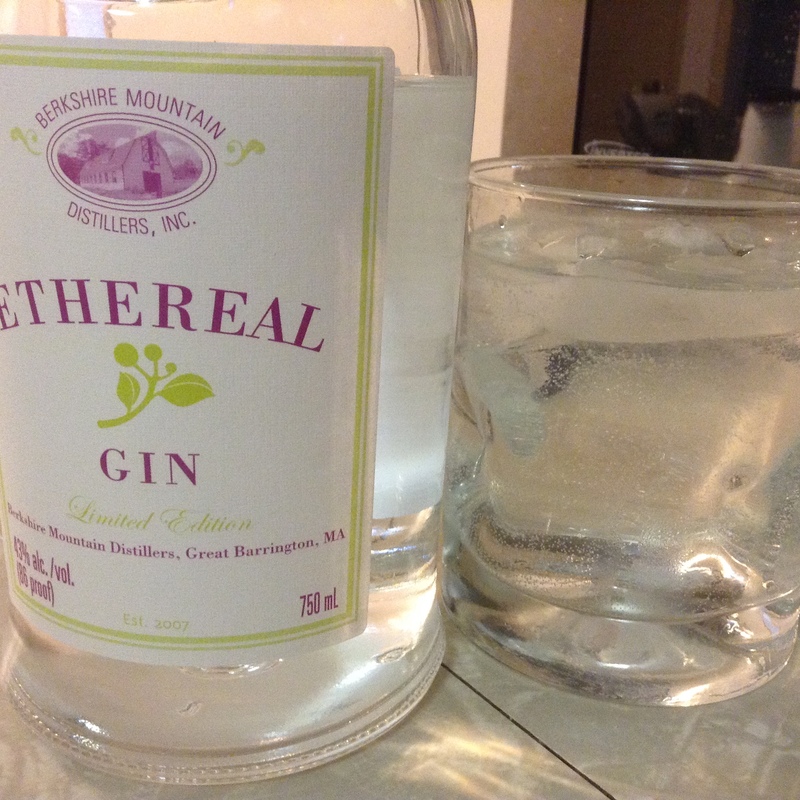 This entry was posted in Reviews and tagged Berkshire Mountain Distillers, Gin, Gin And Tonic on May 24, 2015 by stilldaddy. Balcones (named after the Balcones Fault Zone, I presume – something I learned today), only around since 2008, has already had a sordid history. I’ll not get into the details here, but you can read about the current tail end of a dispute between Chip Tate, the distillery’s builder and founder, and his financial backers here. That’s all I’ll say about that. I describe Rumble above, just as Rumble describes itself, as an aged spirit, not a whiskey. That’s because to be labelled ‘whiskey’, an aged spirit must be distilled from grain. Rumble isn’t. It’s made from wildflower honey, turbinado sugar (natural cane sugar that has had most of its molasses removed), and mission figs. After these have been distilled, it’s aged in small oak barrels in Waco, Texas, home of this genuine craft distillery. Craft is a word with ever broadening definitions in the whiskey world (and I’m sure in the world at large). Many a producer has bottled whiskey sourced typically from MGP (Midwest Grain Products in Indiana), slapped their home spun story on a label, and claimed it to be of their own making. Not Balcones. They distill and age everything on site. After recognizing the genuine craft nature of this distillery’s expressions – a real diamond in the rough – I was eager to purchase a few different bottles and give them a try (despite their relatively high price tag). So after a trip to Total Wine in Norwalk, Conn., I came home with some potential treasures. Let’s see how Rumble fared. Light copper, maybe an orange brass. Slight alcohol, buttered raisin toast, dried figs and dates, other dried golden fruits (not really sure how best to describe this; golden raisins, maybe?). Honey, sweet and dessert like; freshly baked and honey-buttered croissants that are nicely flaky on the outside and soft and moist on the inside. I thought this would remind me of a rum, due to the sugar, but instead it feels more reminiscent of a sweeter, younger cognac. I’m finding just a slight hint of cinnamon. This has a really nice nose on it. Not particularly complex, but something I enjoy breathing in through the olfactory, picking up the essence of the sweet, buttery, honeyed desserts cooling on a rack in the kitchen. The empty glass smells distinctly of corn which makes me wonder, given the categorization defiance of this spirit (and consequently the label) if this wasn’t aged in the barrels previously used for some of Balcones other spirits. Their corn whiskey (Baby Blue, or True Blue), perhaps? Medium to thick mouth feel. Throat warming (not offensively so). Sweet but certainly not cloying. Raisins, gentle sweet oak, powdered sugar over french toast, dried stone fruit (apricot, maybe? Plum?). Finish isn’t quick, but not quite long enough to say it’s ‘medium’ either. The one lasting impression after I swallow is that cognac-like, gentle sweetness. It lingers on with impressions of these fig/date candy wafers my friend used to give me when I was in middle school. They were sweet the way dried fruit is when it doesn’t have added sugar. This is sweet, for sure, but pleasantly so. There’s just enough dry warmth and a smidgen of saltiness to keep it from being too sweet. This is a refreshing spirit as it’s set apart from the normal bottles of anything dwelling on liquor store shelves. My first glass left me thoroughly impressed by the nose and disappointed by the mouth. After my third, however, it grew on me significantly. The first time around seemed dry and uninspired, but after the final glass for this review, it really blossomed into something enjoyable. Would I restock it? Likely not. Partially because I can’t quite justify a $54 restock fee just for the novelty, partially because it’s not my favorite of Balcones expressions, and partially because the future of Balcones is uncertain. So, unsure of the future quality or pricing of this distillery’s lineup, I’ll leave it at this: If you would like to try something different, pleasantly enjoyable, and genuinely ‘craft’, buy yourself a sample at the very least. If you want to spend the money on something you’d like and is all but guaranteed to be available months or years from now, I’d recommend spending it on a decent cognac instead. It will either be cheaper than Rumble or quite good if you want to spend an equivalent amount of money. I have a bottle of Remy Martin VSOP that, while not nearly as unique, is enjoyable to me on the same level. If, however, you feel that you don’t want to miss out on this kind of opportunity, buy a bottle while the buying’s good. It may not be on shelves much longer. Their single malt and Brimstone are already selling out locally. My overall rating is ‘Nip/Bar‘ because of these factors. 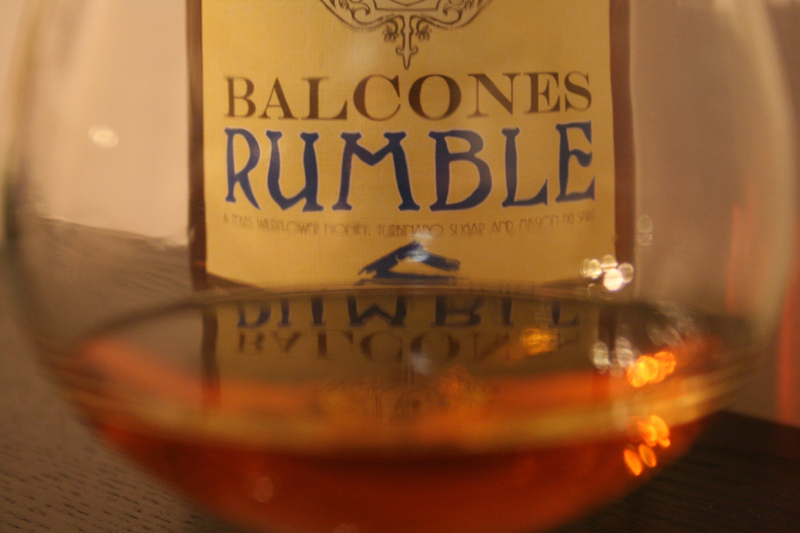 This entry was posted in Reviews and tagged Balcones, Balcones Rumble, Craft on February 11, 2015 by stilldaddy. Ah, here we are again. Or rather, here I am again. Whether you show up or not is entirely unknown until it happens. Back in April, I purchased a lot of alcohol. So much so that my stomach was all knotted the second I saw the total on the screen and swiped my card. They say you don’t feel it as much when you use plastic instead of cash, but this one hit hard. The total came to a number so high that I shan’t mention it here, and it took me a while to tell Wife. Because of that largest purchase I’ll ever make (at least in one trip…), I made a promise to Wife that I wouldn’t purchase anymore alcohol for the rest of the year. The exception(s), of course, were if I happened to stumble upon a bottle of something very hard to find, or something so cheap I would question the soundness of the store owner’s mind. I found a bottle or two that fit that criteria, but that was it. For over half of the year I had to rely on the stores already built up in the basement which, if I’m honest, could hold me over for several years. My original intention was to review everything on the shelf to keep this blog going and to keep it whiskey related. As you can tell, I failed. But it’s a new year! Purchases have once again picked up and new items are being added to the “tried it” list. However, I still feel the desire to run through and review everything on the shelf. While that will take a while at a pace of one review per week (perhaps sometimes more), I’ll move onward. “But it’s already the third week of the new year,” you say. Yes…yes it is. If I’m anything, I’m a procrastinator. But I’ve procrastinated enough and it’s time to keep moving with this blog I started for a reason. Now the question is, do I review at random or move through the shelves left to right, top to bottom? The latter would be alphabetically by distillery starting with American whiskey, moving through Canadian, into scotch, and finally rum, because that’s how my shelves are organized. This entry was posted in Uncategorized on January 14, 2015 by stilldaddy. Living in Connecticut, I’ve learned to shop around for alcohol. Difference in price on even something as ubiquitous as Jack Daniels #7 can be as much as $10 to $15 within the same town, sometimes even down the street. About a year ago I walked into a small liquor shoppe (it felt like it should be spelled that way) and saw a bottle of Woodford Reserve for a whopping $45 at a time when it was generally available for no more than $30 almost everywhere. And that was on the high side. Add to that a 6.35% sales tax (do you know your state’s sales tax to the nearest hundredth? ), a fairly high excise tax, and state minimum pricing, and price shopping becomes a must. Ironically, I’ll sometimes spend more in gas than I save on a particular bottle by getting it at Store A instead of Store B, but I love knowing I got the product itself cheaper. High five to myself, which is just me clapping once, and I look silly, so I’ll not do that. My iPod has become my go-to device for all things whiskey related, including shopping. I have all of my favorite blogs bookmarked*, and all of my liquor stores bookmarked as well, at least the ones that have online inventory and pricing. These include several stores in the area, New Hampshire’s, and a few others out of state. New Hampshire’s is very helpful as it lists price, stock, and location. I frequent their stores at least once a year to take advantage of their relatively close proximity, low general taxes, and zero sales tax. I should note, in case you’re thinking of shopping there now that, in general, their prices on American and Canadian whiskies are excellent whereas their prices on Scotch are high. Even after tax, Scotch is usually cheaper here at home. This is a generalization and doesn’t apply to every single whiskey, but it’s usually true. So I’m making my Christmas wish list for anyone who feels generous enough to buy me a bottle of various whiskies, and I notice that Pappy Van Winkle bourbons are available in a few stores relatively close (meaning shortly after crossing the border). Wow, I think, it’s crazy to see them available at specific places. They’ll be gone by the end of the day, for sure. Especially if you can see where they are. The next morning comes and, low and behold, aside from a single purchased bottle, they’re all still there. Hope flooded my system and I began to scheme over a “quick” trip up after lunch break or immediately after work. I debated this all morning until just after 9, when they open, and I decided to call to see if the stories were true; was there actual Pappy available for me, the common man? I figured as much and went on about my day. What struck me about the whole experience, and is the reason for my post (after that significantly lengthy introduction; thank you for sticking with me), was how much I would have done to go get a single bottle. Pappy Fever is one word for it. I was wiling to drive two hours, take a whole afternoon off of work, and shell out $60 and nearly a whole tank of gas for a single bottle of bourbon. Say what? Somehow that bottle would solidify and validate my enthusiasm. I’d become one of the professionals. It would be like the plaques on the wall in a doctor’s office. See? It’s official. But then I started to think (before the phone call to NH). I have easy access to several bourbons that I thoroughly enjoy for half the price of Pappy and significantly less hassle, like Elijah Craig 12 year. Yes, but Pappy is wheated. So are Larceny and Maker’s Mark. Weller (by the same distillery!). And they’re available! Yes, but Pappy is bottled from the best hand-selected barrels. So is Blanton’s. Elmer T. Lee. Eagle Rare. And those are all from the same distillery. No, they’re not wheat recipes, but they’re all delicious, easy to find (save ETL on occasion), and worth every penny. Like Serge’s comic strip on Whisky Fun suggested: “If they all only select the best, where goes the rest?” It’s not as if the cream of the crop goes in a Van Winkle bottle while the rest of the Buffalo Trace lineup is crap. But you’ll only truly be a bourbon enthusiast if you get your hands on a bottle of Pappy. It’s a rite of passage, man. Unless you go through it, you’ll always be a whiskey noob. And my thirty open bottles of whiskey don’t say otherwise? The fact that I can walk into a liquor store and generally know and understand whiskey more than the employee doesn’t mean anything? Marketing’s spell on me having long been broken doesn’t help my advancement? I’m not against buying Pappy and I’m sure it’s a fine bourbon, but for now I’ll be content to try it at my local whiskey hole (whenever I can get there; diapers don’t change themselves). My family needs me to work the afternoon so the mortgage gets paid and food is on the table. My children need me home, not galavanting through New England in search of a mystical bottle, so that I can build relationships with them. And I need to keep my cool and not give in to Pappy fever so that I can do those things. Besides, if I can’t be content with the several shelves of whiskey I have in the basement, another bottle won’t change that. “If I just get this one whiskey,” will still be thought. Remember that wish list I mentioned above? Once it’s completely fulfilled, there will be another. At present, Pappy has the coveted spot of being considered the apex of American whiskey (aside from the Hirsch 16 year which has found its way back into stores at a gazillion percent increase in price). At some point another whiskey will overtake it, then everyone will trample each other for that one. Instead of adding to the clamor, I think I’ll cut the crap and sit back, relax with a good bottle, and watch from a distance. *It is here that I will give a shout-out (not that they need it) to the blogs I check obsessively, including (but not limited to), Chuck Cowdrey’s Blog, Sku’s Recent Eats, The Coopered Tot, and Scotch Noob. This entry was posted in Uncategorized on November 22, 2014 by stilldaddy. A Son Is Born! Collect Presents. Two months ago our son was born. We were at a routine, scheduled appointment with the OB when, suddenly, labor! Off to the hospital we went, Buttercup in tow, and worked together to welcome Seth to Earth. Everything was routine and normal except for the unusually short labor for a first-time mom (under six hours). After two days at the hospital, we brought him home. Life has since been a haze of sleepless nights, exhaustion, general disarray, family visits, take out food, and joy. For the first few weeks I didn’t even know what day it was. Hours would pass stealthily by. The kitchen wasn’t getting cleaned (it’s the one room that I like to keep mostly tidy because it’s the room where messes grow most rapidly). The living room and our bedroom decreased in size very quickly. We were (and, to an extent, still are) on autopilot. Wake up, shuffle through a quick morning routine, throw a lunch together, grab a Clif bar for breakfast, head to work. Hope all day that I don’t absentmindedly screw something up. Come home, shower (after up to an hour of distraction), get dinner ready if Wife hasn’t (which is usually the case; newborns need lots of attention). Give Buttercup at least a few minutes of undivided attention. Feed Buttercup, eat dinner (hurriedly, there’s still plenty to do before bed). Give Wife at least a few minutes of undivided attention. Try to empty the dishwasher if Wife hasn’t so we can fill it back up again. Laundry. Buttercup to bed. Clear and clean kitchen counters. Us to bed (after much deliberation and distraction, significantly later than we should). Repeat. I thought we were slow getting out of the house with one child. If there were an emergency – say, the apocalypse, for instance – we wouldn’t make it. We’d forget most of the essentials, have to run in and out of the house several times, chase after runaway children (though, in her defense, Buttercup is very good about staying where we ask her to – unless she’s feeling playful). If we plan to leave by 9, we might be out by 11 but that’s probably wishful thinking. A breast feeding child who soils his diaper every 23 minutes adds a significant amount of lag to everything. I like things efficient and streamlined. A few weeks ago I was able to make a trip to Target on my own. I felt like The Flash. I was gone, in, out, and back in less time than it takes us to get everyone and everything ready and in the car. It was amazing! I had forgotten how efficient I am alone. But, amazingly, I’m willing and excited to trade in efficiency for lag again. I’m loving two children but it’s not enough. I want more. I worked at a daycare for four years and was generally with at least ten children at a time. Three year olds, fours and fives, or kindergarten through second grade. I absolutely loved it! Every day was different. It was challenging and often stressful but a complete joy. For me, two children is too quiet. Wife and I have both agreed that four is a great number. Whether we have more biologically or through adoption, we’ll see. Wife wasn’t too fond if being pregnant, but adoption is no walk in the park either. Each comes with its own challenges and rewards. Life is beginning to move into a more stable routine, and each family member is discovering their new role and rhythm. Buttercup is a great big sister and Seth’s little smiles light us all up. More of this will be excellent. In the mean time, I’ll cherish all the sleep I can get, and enjoy whiskey when I’m able (I still haven’t opened my celebratory bottle of Hedonism; I’ll get to it eventually). This entry was posted in Personal News and tagged Family on September 16, 2014 by stilldaddy. I’m finding myself in a nostalgic mood which doesn’t happen often. I tend to dispose of life’s excess without a second thought. Old photos, souvenirs, Christmas cards, all gone: thrown out in a fit of needing more organizational and breathing space. Greeting cards actually get disposed of after my first read through. What do I honestly need to save them for? Especially the signed-only cards, the ones where the sender just signs their name after the card’s author’s whimsical rhyme or generic seasonal greeting. “Season’s Greetings.” What is that? Isn’t it a season at every moment? Why don’t I get cards in the mail for the summer solstice? “Season’s Greetings.” Only this one comes with a wonderful illustration of a charcoal grill (because illustrations of gas grills just don’t cut it) letting me know that it’s been chosen for just this special occasion, complete with a lonely signature and maybe a little hand-drawn heart. Greeting card cliches aside, my nostalgic moods are few and far between and short lived when they do happen. But they do happen. Between Wife’s pregnancy, fostering Buttercup, a busy job, and a house needing updates galore (and the outdoor season is upon us, perfect for viewing exactly which exterior updates are begging to be done), I’m overwhelmed. This is when nostalgia sets in. When the present succumbs to life’s inevitable changes, especially in significant quantity (and quality), I look to certain things past with longing. Events, relationships, places. The constancy of those things, as they’ve already happened and can’t be changed, is comforting. No matter how much time passes, the past won’t change. Life’s circumstances will change. I’ll change, and will look at the past through maturing eyes (hopefully), but the past itself remains constant. I was in the basement getting some laundry going when I remembered a box with my high school yearbooks. I picked out the one from my graduating year, as that’s where the most significant notes were written by my classmates, to remember. Certain notes I expected to be there, but others I was surprised to find as I’d forgotten them. And certain notes were missing that I know are supposed to be there; maybe I’m missing some pages? I discovered/remembered a few things. I was a real flirt. The ratio of girls’ notes to guys’ notes is like 25:1. For my entire senior year, I sat at the “girls’ table” at lunch. There was something about the conversations my fellow male classmates had that just irked me so I avoided them during the most sociable part of the day: lunch. Instead, I sat with the girls whose conversations were much more mature, and more enjoyable to listen to and take part in. Yeah, right, you say, they gossip and talk about….yeah, yeah, yeah, I know the stereotypical high school girl conversations, but you have to understand that my class was, even according to several teachers, the best class to ever pass through our high school’s halls. We were more mature and more unified than any other class. I was proud to be a part of it. So, anyway, it was nice to reread that I was popular with the ladies. I’m settled now, so it doesn’t matter in the least, but it’s fun to remember. The three adjectives that I see repeated most often were that I was sweet, funny, and loud (and in that order). The sweetness has been tempered by increased responsibilities and the mental and emotional space they occupy. Some of the authors of the notes would be disappointed to find that out. The humor has been honed, focussed, and reigned in by integrity (thankfully). The loudness has only increased through my time working with teenagers; these vocal cords go up to eleven. I once was at an event held in a stadium that was being recorded. The announcer mentioned a date and used the wrong month, and I shouted out the correction. Mind you, I was up near the nose bleeds and the speaker was in the center of the stadium. Listening to the playback later, I could distinctly hear my shout. I was very proud. There was a particular note that I was looking for in the yearbook. I looked through it at least eight times to no avail. I’m convinced there’s a section missing and I’m quite upset by that. When you spend seven to eight hours a day with the same group of people for nearly all of your growing-up years, you come to cherish those formed relationships. One in particular, with a former lady friend (I had a thing for her; she says she never did for me but I never believed it; either way we were really close), has since fallen silent due to a lack of upkeep and some misunderstandings. This is one of two relationships that I tend to look back on the most. Probably because it was one of my deepest and most intimate (then) and when life gets tough and my deepest and most intimate relationship (now, and compared with all of them ever by a long shot) with Wife gets tough as well, I feel alone. Like I’m trekking through this desert companionless and isolated. And when I feel alone, I like to remember times when I didn’t, and the people that helped me feel that way. I play the “what if” game. What if we had dated? What if we had made different decisions? What if I had poured my heart out before it was too late? What if we had gotten married? I try to keep my answers in check as I can wander too far without a tether in reality and paint pictures in false light cast by ideals. That’s the problem with the “what if” game. Instead of helping me cope with how things are and where they’re going, I move toward how I wish things were. And when that happens, I start losing maturity ground. What I need to do is man up and adapt to the changes, not lament over the loss of the familiar. I can’t lead my family through new territory if I’m self medicating with nostalgia. Rather than being sober and in the present, ready to take on the unknown for the sake of Wife, Buttercup, and the little one on the way, I’m doped up on ideals of the past and “what if” scenarios. That doesn’t help anyone. That numbs my senses and renders me useless. Learning from the past is a great, and implementing appropriate changes from that education is wise. But dwelling there can be detrimental. *I don’t typically explain my drink choice, generally because there is no explanation to be had (I’m just drinking what I’m in the mood for at the given time of writing that particular post), but I felt it appropriate here. Elijah Craig 12 year was the first bourbon that caused me to stop and contemplate what time had done not just with the whiskey in my glass, but with me. I looked back at where I’d come from, and what I’d been through, over the last twelve years. And this bourbon had, the entire time, been maturing in barrels in Kentucky through some history of its own. I felt it a was good choice to drink for this post. This entry was posted in Memory and tagged High School, Just Thinking on June 23, 2014 by stilldaddy. If you haven’t, first read my Intro to help you understand my review process.Here we are (finally!) at the final sample in the Compass Box (CB) sample pack. To recap, each of the five samples of CB’s main whisky lineup came in a 50mL vial that I split with my whiskey buddy Jake who purchased the pack. Hedonism was the last vial in CB’s suggested order as indicated through the presentation in the box and through the order of accompanying tasting videos on CB’s website (which we watched only after we had already completed our tasting). This was the bottle whose packaging I most enjoyed (which never factors into my review of a whiskey, but I do notice it). I had no idea what to expect from the blend and all I knew going into the tasting was that this, unlike any of the other CB blends (and unlike any blended scotch I’ve ever had) had no single malt in its composition at all. It is comprised entirely of grain whiskies which are typically used to fill in gaps with blended scotch but here are its only components. As a quick lesson in scotch terms, a single malt scotch is comprised entirely of one grain: malted barley. Malted means that the barley was germinated (caused to sprout) by soaking it in water and then this process was halted by drying the barley with hot air. The germination produces enzymes in the barley which change the starches into sugars. Barley already contains some sugars but the germination produces others that were not already present. It also helps to make the barley more yeast friendly. Grain whisky is produced from any grain other than malted barley (including barley that has not been malted); typically corn, wheat or rye. I have my guesses as to which grains are used in Hedonism, but I’ll get to that after the tasting notes. At first, there is a similarity to the white wine character of Asyla, but that fades. This is a complex nose with plenty to observe. There is very slight ethanol. There are notes of vanilla and custard, sweet bourbon, and rye whiskey (that sour pickle juice). There are notes of white grapes, white flesh apples* (Macintosh, Macoun), ginger and citrus (some orange but more lemon). I’m finding delightful caramelized sugars. The ethanol, forgotten through the above presentation of teasing scents, presents itself again (still very slight and not offensive at all). This is a beautiful, enticing nose with plenty to enjoy and look forward to with each approach to the glass. After time, and when there is little left in the glass, there is assertive, rich cinnamon and cinnamon dusted rice pudding (sort of a combination of custard and sweetened condensed milk). I want to smell this whisky for hours. Rich, creamy, sweet, hot (not offensively so), and balanced. This is like drinking desserts. Creamy custard and sweet grains. The finish is hot, long, and caramely sweet, like the way your palate feels after eating creme brûlée or vanilla pudding (the good stuff) twenty minutes ago. That lingering, sweet richness without being cloying. I really want to continue experiencing this, and it has what I call “the draw” for sure. It just keeps drawing you back for more. Hedonism, as defined by dictionary.com, means “the doctrine that pleasure or happiness is the highest good,” or, “devotion to pleasure as a way of life.” I would say that this blend of single grains is aptly named. I derived plenty of pleasure from even just the nose. As I said, I wanted to sit and continue to experience Hedonism for hours; there are very few whiskies that I have found this enticing. More, please. If I were to wager a guess as to the grains used, I would say rye based on the pickle juice in the nose as well as the ginger and citrus. I would also guess that the dessert quality of this whisky comes from wheat which has the same sweet effect with American whiskey. Corn can also impart sweetness but typically identifies itself by a distinct corn smell which I did not detect here. I could, of course, be completely wrong, but those are my guesses. The aging in first-fill American oak casks (ex-bourbon barrels) also helps to impart bourbon’s sweet notes. What I discovered after the tasting (and just prior to my subsequent bottle purchase) is that Hedonism is produced in relatively small batches. Because of this, and the uncertainty of cask availability with the desired flavor profile, there’s bound to be variation from one batch to the next. This can, however, be the case with any whiskey as, unless you’re drinking a single cask/barrel, you’re drinking from a blend of many barrels/casks that, upon meeting certain conditions, are dumped and blended together to attain the house’s desired flavor profile. The difference here is that the grain whiskies, and their sources, may be different from batch to batch. CB ensures that while variation is inevitable, the same hedonistic profile will be delivered. As the batch I sampled was not the first, I’m inclined to believe it. What a luscious beauty. The latest batch, MMXIV-A (fancy romany numerals for 2014-A), was bottled on Feb 6 of this year. As Jake purchased the sample pack in March or April, it’s safe to assume what we tasted is from this batch. That and I believe the sample pack is a relatively new CB product so it’s doubtful he purchased a previous year’s offering.This batch is a blend of two grain whiskies both distilled in 1997 making it a 16-17 year old blend depending on when the whisky went into the barrel and when it was pulled for bottling. The age isn’t terribly important but it’s nice to know if you’re going to spend ~$100 on a bottle. These grain whiskies came from the Girvan Distillery in South Ayrshire and the Cameronbridge Distillery in Fife. CB doesn’t say this directly but the distillery towns are provided and as these are the only grain whisky distilleries in their respective towns, it’s understood. Because I enjoyed this so much, but it’s expensive, my overall rating was very difficult to arrive at. Were this even a $50 whisky I would readily recommend it as a stock bottle. But at or over $100, I just can’t do that. I waffled between nip/bar and bottle. I would heartily recommend you at least go purchase yourself a sample at a local whisky bar or wherever you can. It’s certainly worth that. But, unless you like rich, sweet whiskies, it may not be worth it to purchase a whole bottle. I did because my wife and I are expecting a child soon and I wanted something to open for that special celebratory occasion. That made the price easily justifiable for me. But under normal circumstances, $100 for this bottle would have me very thankful that I was able to sample it as I passed it by on the shelf for something cheaper. Between the price and the expected variation from batch to batch (however slight it may be), my overall rating is nip/bar. That being said, if you want something for really special occasions, I would readily recommend this. 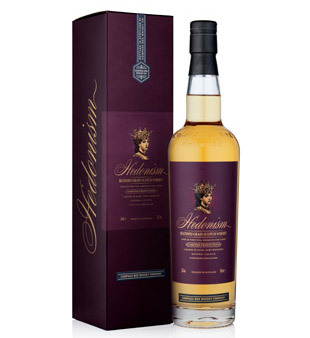 This entry was posted in Reviews and tagged Compass Box, Compass Box Hedonism, Reviews on June 14, 2014 by stilldaddy.